Double vinyl LP pressing. 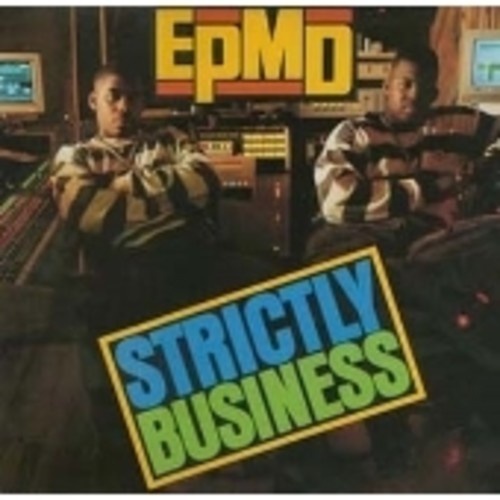 Strictly Business is the debut album by golden age hip-hop duo EPMD. It was originally released on June 21, 1988, by Fresh/Sleeping Bag Records. It peaked at #80 on the Billboard 200 soon after release, yet it earned an RIAA gold album certification within four months of it's release. In addition, it has received much positive critical attention since it's release. In 2003, the album was ranked #459 on Rolling Stone magazine's list of the 500 greatest albums of all time. The album is known for it's lighthearted party raps and funky sample-reliant production. Of it's four singles, three landed on the UK Singles Chart and two reached the US Hot R&B/Hip-Hop Songs chart.